Aside from the motorcycle itself, the jacket is probably the most recognizable symbol of the culture. They’ve been featured in mainstream media for decades as an unmistakable image of cool. The black, often shiny, always leather design garners attention almost every time. But that’s not why we’re here looking at them. We’re here because they are also a very important piece of safety gear. These coats are made from leather not because it looks cool, but because of how resilient and strong it is. The natural fiber will hold up to a lot of abuse, protecting the wearer from the wind, and helping to prevent damage in the event of an accident. Road rash is a very real thing, but when you’re wearing protective clothing made from leather, the likelihood of you walking away unscathed suddenly goes up by quite a bit. The torso is the largest exposed area of the body on a bike, so having a well-built product made from only the best leather is going to make the ride a whole lot more enjoyable and safer. This Spring 2018 update features some brand new motorcycle jackets that have hit the market since we originally wrote this article. These new jackets are not only hot and trendy right now, but they serve their purpose as one of every motorcylist's important accessories. Admittedly, there isn’t all that much that needs to be taken into consideration when choosing a coat. With a few pretty radical exceptions, which we will touch on just a bit in this buying guide, most of them are going to retain the same classic style and aesthetic that first made them iconic so many decades ago. As long as they protect you, that’s all that really matters. So, with that in mind, let’s delve in and take a look. This buying guide is all about motorcycling coats, so what better product to start with than this one? A true motorcycling coat is as much about iconic style as it is about safety, and this one fits the bill perfectly in all aspects. Milwaukee designed this to be the ideal choice for motorcycle enthusiast of all types, and they hit it out of the park. This is an example of a motorcycle jacket style, as evidenced by the offset zippers and cropped waist. Since this was made in the style of a motorcycle coat, or “Perfecto”, it already has an iconic look. However, Milwaukee wasn’t content with that, and went out of their way to make sure everything about it absolutely screams retro motorcycle culture, and it ends up working out perfectly. Most manufacturers would be content with slapping a size in their coat, referring the customer to their sizing chart, and be done with it. This one is different. So many of the features found here are geared toward making sure this coat fits you exactly the way you’d expect it to. For a genuine leather option to be this affordable pretty unheard of, but here it is. While this may not be the highest grade of leather, it is by no means of inferior quality, as it provides all of the durability and protection of a much more expensive version. For the next selection on this list, I went with a “Cafe Racer” style. This one, by Viking Cycle, is about as stylish an offering as you’re going to get, which is a nice compliment to all of the racer’s unique design elements. As sleek and minimalist as it appears, that is only skin deep, since the interior is bursting with enough pockets to hold all of your most important belongings. It also has a unique weight balancing system to ensure that you never feel out of sorts. For the most part, you’ll only find armor on the more expensive versions of these coats. Viking Cycle, however, doesn’t mess around, and decided to include it in the elbows and holders, along with a designated space specifically for extra spine protection. Viking Cycle didn’t even pretend to use leather for this piece, and it turned out to be a great decision. Instead, they used a durable mesh fabric for the shell, ensuring the comfort and wellbeing of the rider on even the longest rides. Because this isn’t a leather coat, or even faux leather for that matter, the makers at Viking Cycle were able to reduce the manufacturing cost, and in turn passed that savings on to the consumer, leaving you with an exceptionally versatile piece of gear. This is the second of two offerings from Viking Cycle to show up on this list, and this one clearly takes its job very seriously. They’ve pulled no punches when designing this one, and it becomes immediately clear just what it is this product aims to do: protect the rider at all costs. Instead of hiding all of the safety features beneath a pretty shell, they’ve opted to bear all, so to speak. All of the padding and extra stitching is in plain view so you know exactly what you’re getting into. We’ve established that the fabric itself found on this is breathable, but sometimes, on those really intense rides, that just isn’t enough. To fix this, Viking Cycle included zippered air vents that can be easily accessed to offer even more airflow to cool you down and keep you dry. The fabrics used in the construction of this product attain a trifecta of vital features. They are durable enough to hold up to a lot of abuse, they breathe, wicking perspiration away and keeping you comfortable, and they are waterproof, keeping the rain from getting in and dropping the temperature. This product is all about safety, and spares no expense to achieve that goal. Fortunately, that expense isn't passed onto the consumer, so that anyone can ride in style and comfort knowing that their well-being is in good hands. Another true “motorcycling” coat, this product utilizes tried and true aesthetics to bring riders everywhere a fine product that the can be proud to wear. Its milled leather shell is going to keep you safe and looking good for many years to come without wearing out or fading and this piece is bound to become your go to coat anytime you leave the house. Coats can be pretty hard to fit properly, mainly due to the fact that they have to be at least somewhat rigid to protect the rider. Nomad took care to make sure that as long as you’re using their sizing chart, you should always have a garment that will fit you true to size. The rust proof buttons found on this jacket go a long way to helping it keep up its sharp appearance year after year. There’s not much worse than taking meticulous care of the leather, only for the buttons to rust and ruin the appeal. 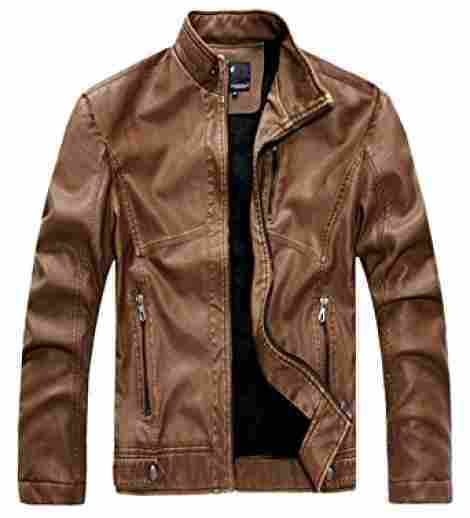 Another top quality leather coat shows up on this list with a very reasonable price point. Milled leather is going to cost you a bit less than other grades, but it is a staple in motorcycle clothing thanks to its high level of durability and strength. This helps to guarantee that you get the best possible value for your dollar. This option is going to act as sort of the crown jewel of this buying guide. Not because it’s super pricey, far from it. This is still a very affordable option that has been made from genuine lambskin leather, giving it unmatched strength and versatility. Done in a bomber style, the look and feel of this will leave a lasting impression for hours after you take it off. That right there is the mark of a true masterpiece. The lambskin leather is going to appear smooth and kind of stiff when you first put on this product. Give it some time to break in, and you’ll start to notice just how supple and soft it really is. 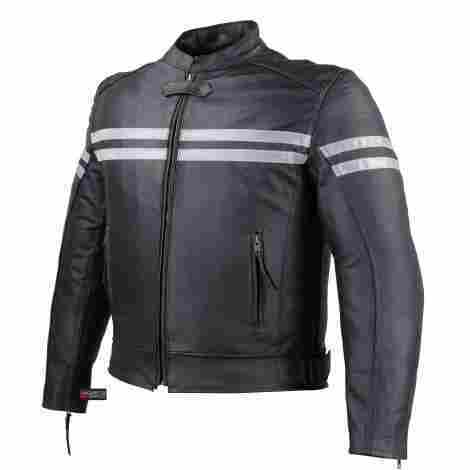 To go along with and complement the high quality lambskin leather outer shell, this product has a polyester interior that is quilted for optimal comfort while riding. 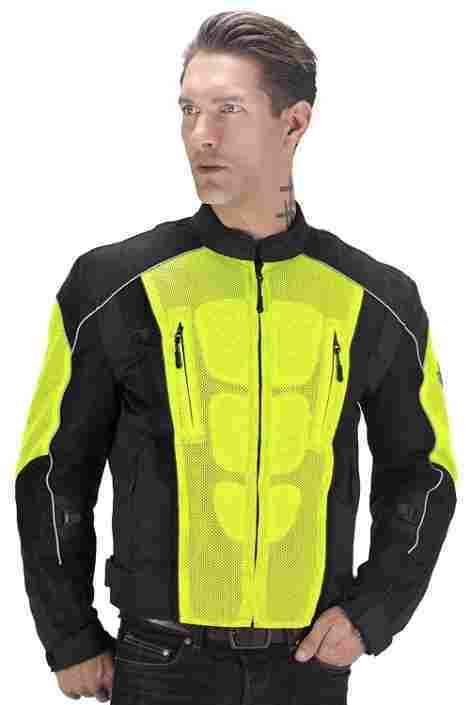 The breathable fabric also keeps the rider uncompromisingly dry, which is a must on those long drives. As far as this list is concerned, this is an expensive product. In the grand scheme of things, it isn’t very costly at all, especially when you factor in all the quality and care that went into putting it together. In terms of value, this is priceless. For all of the fuss I make about only buying motorcycle coats that are made from genuine leather, there are a few exceptions. In the name of variety, I wanted to include some options that are more affordable for the average rider. This one by Tanming is a good choice; because not only is it cost effective, it has a level of detail and style that you wouldn’t think to see in a lower priced version. It’s also one of the warmer options here, making it great for colder rides. All of the details in the stitching that went into making this coat give the impression of a garment that costs much more than it actually does. This gives it a high level of versatility so that you can wear it for more than just riding. The entire interior of this option is lined with just the right amount of a thick faux fur, making sure that the rider stays warm throughout the day without having to load up with bulky layers of clothing. This includes the hood too, which is a detail often overlooked by other brands. For all of the abundant features included, it is made from faux leather, so the price is very manageable. It’s still a solid piece that is going to offer a ton of protection, it just costs a lot less than comparable options made from real leather. This slick number seems to be an amalgamation of a traditional motorcycle style, again known as perfecto, and more streamlined bomber style. It’s still cropped at the waist and looks very much like a motorcycling coat, but it also features cuffed sleeves and more symmetrical zippers. Overall, this is a very fashionable option that can be easily called into action for a night out on the town, or even used as an everyday piece. I think having a removable hood is just a handy feature. As useful as they can be, sometimes they just tend to get in the way when you do not actually need them. This way, you can just take it off and store it away until the weather gets rough again. 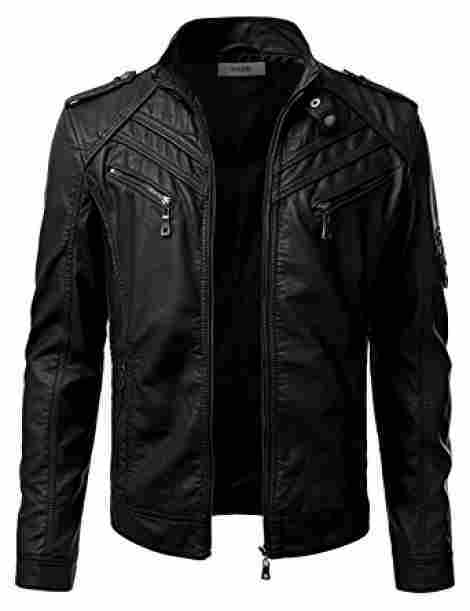 A lot of biker coats on the market are cropped quite high at the waist, which is expected because that is the traditional design. This one though, sits just a bit lower, providing full coverage and extra warmth to your torso. 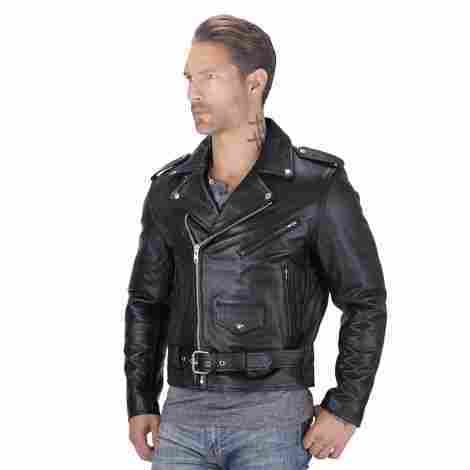 As far as faux leather coats are concerned, this particular one does run a bit in the high side where price is concerned. That price is justified, however, by all of the care and attention that went into making it. 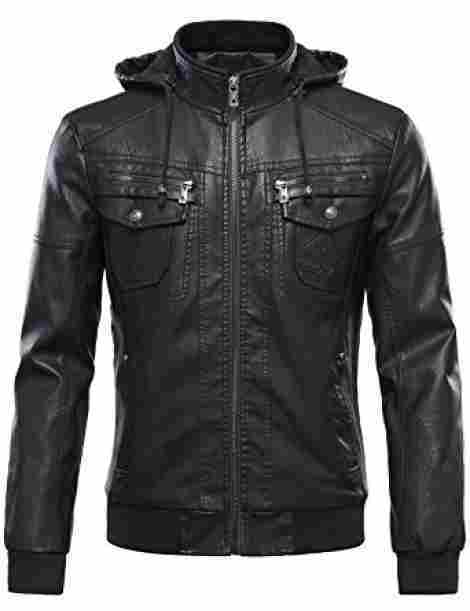 The only aspect of this coat that is “cheap” was the use of a synthetic material, and even that is of a high quality. Very stylish and modern look offsets the fact that it isn’t real leather. Top grade cowhide leather. That is the first key step to making a top-of-the-line motorcycling coat. After that, it takes high standards and attention to detail to really make a memorable garment, all of which are in abundance with this jacket. It’s another example of a perfecto style coat done the way it should be, and is certainly worthy of the investment. All of the work that went into making this has resulted in very functional garment. With safety and performance in mind, you can buy, and then wear, this piece with confidence, never second guessing your decision even a little bit. The makers at Xelement want you to abuse their product, that’s why they pulled out all of the stops when it came to long-lasting performance. It’s one of those options that just get better the more it put through. Of all the genuine leather options found in this buying guide, this offering from Xelement is among the most affordably priced. Blending style with a whole lot of substance, this one stands out from the rest of the pack when it comes to pure value. In this buying guide, there are a few selections that are made from faux leather, and are included here for the sake of value. Each of them is of superior construction, so they are great options. This one goes even further, making it hard to believe that it isn’t made from the highest quality genuine leather. Take a look at the price, and it becomes more believable, but only reluctantly. That just goes to show how well put together it is. This doesn’t seem like it should be much of a big deal, but when it comes to biker coats, be it faux leather or real, color isn’t normally considered. All of the choices here are well done, and none of them come off as looking tacky in the slightest. All of the little touches that were put on this coat show that the manufacturers care about their products, and weren’t just looking to put out another cookie cutter garment for the masses. From the cross hatching to the stitching, everything was done deliberately and with care. It’s hard to find a coat of any style that costs as little as this one, yet here it is. This is a high quality product that costs less than some outdoor sweaters. You get a lot for very little here, and that can be a very rare thing to find. To finish things off here, I’m going to go with a high end option made in my preferred style. This is a cafe racer style, so it has the requisite aerodynamic design, with very clean lines and understated features. What makes it so appealing is the minimalist approach that was taken while building it. As a result, it clings to the body, providing protection and comfort while still giving full freedom of movement to the wearer. One of the trademark aesthetic features for cafe racers is the racing stripe that is found on many of them. The manufacturers pout this to good use by making them reflective, which increases that chance that you’ll be noticed at night in the darkest conditions. There are a lot of people that are convinced that you won’t be able to find a high quality genuine leather coat for less than several hundreds of dollars. While it is a difficult task, it isn’t impossible, and this is one of the better examples of that. This product isn’t going to innovate at all when it comes to fancy bells and whistles, and because of this, it comes at a fair price. You’re still getting a very good product; it’s just not going to do anything unnecessary to keep you safe and sound. The goal of this buying guide is to help you see how necessary the motorcycling coat is to the modern rider. I specifically chose as many selections constructed from authentic leather as I could because I wanted to provide a vast array of highly fashionable products that also maximize safety and comfort. Synthetic fabrics may very well be more affordable, and in some cases a bit sturdier, but none of them can encapsulate all of the key features that the best gear requires as the real thing. As for the few on this list that broke tradition in terms of design, that was done for two reasons. For one, I wanted to include as much variety as possible, as I always try to do. Second, those are meant to be utilized a bit differently than the rest and may be better suited to racing or long distance rides as opposed to general everyday use. It’s important to remember in that case that because they are built to satisfy a specific need, they are, for the most part, going to be significantly more expensive. With that in mind, I made sure to choose only the best of each type, making sure that everyone is a shining example of the craft. I’ve included the following four criteria that are going to give the consumer the best chance at finding that perfect final piece of the puzzle that is motorcycle gear. However, as important as the other two may be, neither of them comes close to being as critical as the fabric. As I’ve stated at the beginning, it is absolutely imperative to confirm that the coat is made from the right fabric. If the material is inferior in any way, then all other criteria fall by the wayside and instantly become moot. To be honest it’s not going to matter how well it fits, or how much it costs if it’s not going to hold up in an accident. Any bit of compromise can expose the rider to an endless amount of risk and danger. For all of the warnings to choose the right fabric, there really is only one that’s going to cut it in any real way. That, of course, is leather. It’s obviously very durable, but on top of that, it has a fair amount of give, which is actually where it gets a lot of its wear resistance from. The leather that we wear most often today comes mainly from cowhide. As one of the only downsides to using leather, the animal will have to be killed in order to obtain the skin. However, the resulting product is naturally evolved to withstand almost any environmental situation you can throw at it. Due to the methods needed to obtain leather, as well as the time it takes to produce it, goods made from it are going to cost a lot more than something made from a softer fiber or synthetic material. Speaking of cost, for those who don’t mess around when it comes to their well being, there is another type of animal hide that produces a product that is superior to that of cows. Recently, kangaroo leather has risen in popularity, mainly because it is very lightweight and abrasion resistant. It’s that abrasion resistance that is going to be the deciding factor between whether you walk away from an accident or not. Again, the process to procure the leather from kangaroo hide is an extensive one, so products made from it are highly coveted and very expensive. However, that is all relative, as not being spared from serious injury is invaluable. The only major downside beyond cost is that leather isn’t breathable by nature, so you will get hot and after a while, sweating may become an issue. Regardless, the good far outweighs the bad in this situation. Whichever type of hide you decide to go with just be sure to always choose top-grade, full grain leather. As good and reliable as authentic leather is, it is an inescapable fact that it can be prohibitively expensive. As a result of this, some manufacturers can have a hard time selling their products to the general public. This has resulted in them turning to more affordable synthetic fabrics to produce their products. Admittedly, sometimes this can be preferable to leather, because aside from the cost savings, these materials are going to be lighter, keep you cooler on warmer days. As another measure of protection, more and more options are being outfitted with armor plating at high impact areas such as shoulders, elbows, and back. This armor is usually constructed from hard density foam, carbon fiber, or titanium, among others, which add a significant amount of shielding while not increasing the weight by that much. They help reduce injury by spreading and dampening the impact. Unfortunately, this armor is most often found in highly specialized racing options, and any that you’ll find as an average rider is going to set your wallet back a bit. Every time I look at clothing, especially if it’s designed for safety of any kind, I’m going to stress the importance of a proper fit. The main reason for this is one I preach repeatedly, and it is very simple. If your coat doesn’t fit right, be it too small or too loose, it won’t matter one bit how many safety measures were included in it. A poor fit is going to nullify all of that, and you are going to get hurt. For the sake of argument, though, let’s take a look at why. To start, if the garment is too small or fits too tight, it’s not going to be able to provide full protection to your entire torso. Any impact is going to have an increased chance to break bones or, in a worst-case scenario, cause internal bleeding or organ damage. Also, clothing that is too tight runs the risk of digging into the skin during an accident, potentially causing tears and lacerations. On the other side of the spectrum, a coat that is too loose is going to cause many of the same problems, with the added bonus of possibly catching onto something, in which case can cause broken bones, muscle and tissue damage, or, however unlikely, wrap around an appendage and cut off circulation or even oxygen. Proper fit means more than not being too big or too small. Another thing to consider is the length. Just like being too small, a coat that fails to extend much past the waist is going to offer reduced protection. After all, it can’t protect what it can’t cover. One that is too long is going to restrict movement by cutting off the range of motion, and can also get in the way of the rider or the bike. If this happens, it could get caught somewhere, and even propel the rider from the vehicle. These all seem like far-fetched concerns that could never happen, but if you were to look up motorcycle crashes online, you’d quickly see what I mean and hopefully change your mind. Style is important because like I said before, motorcycling coats that look drastically different from the classic type that we’ve all seen in movies are going to be meant for a particular purpose, and have a different set of cost and features. The motorcycle coat is actually a style of its own, which can also be referred to as “Perfecto.” These are cropped and often contain asymmetric zippers, which are designed this way so riders can lean over their bikes without them digging into the body. This is the style that you are going to be most familiar with when it comes to motorcycle coats. 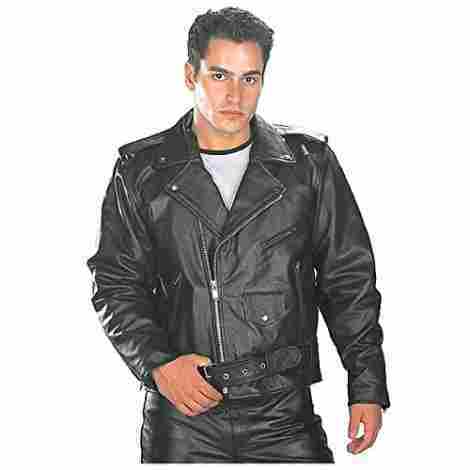 The others are not, by classification, considered motorcycling coats, but have been adopted by riders over the years depending on individual need. The next popular style is known as the bomber. These usually have only one central zipper, a fitted waist, and are cuffed at the sleeves. These are going to offer more comfort than the traditional option, and their sleek profile makes them more aerodynamic. Additionally, this aesthetic also makes them more versatile as they can be paired easily with many outfits. Very similar in appearance to the bomber, the racer is another short, cropped option with a very minimalist design. These came into heavy use after WW2, as soldiers would wear them while racing between pubs and cafes, creating a need for a streamlined coat. They also have a single centrally located zipper and are historically made from horsehide, adding an extra layer of protection to them. Less common is the flight jacket. They are usually quite a bit bulkier and often feature a sheepskin collar or lining. They also have straps across the neck to tightly secure it, keeping cold air away from the body. Because this is also a shorter length option, it is a good choice for riders and is often seen worn on very long road trips or late season excursions. 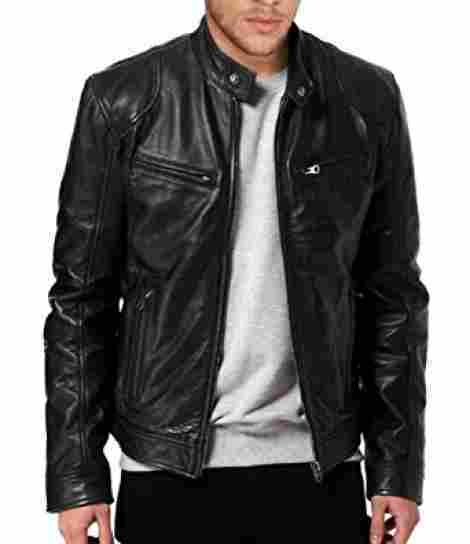 Schott NYC – They’ve been around for nearly a century, and produced the first leather motorcycle coat. Theirs were made famous by the likes of Marlon Brando in his movie The Wild One. Belstaff – A British manufacturer, Belstaff is to Europe what Schott was to the US. They are best known for their long, belted options, though all of them are treated to be water resistant. Norton – Known formerly as Norton Motors, this company originally produced clothing and parts for motorcycle enthusiasts. They have a full range of motorcycle coats but specialize largely in the racer style. Lewis Leathers: Yet another British manufacturer, they have been in the business of making motorcycle coats to protect from the cold damp British air since 1892. Perfecto: The first motorcycle made by Irving Schott for Harley Davidson 1928. It was named after a cigar. It was basically a trimmed down version of the aviator styles that were popular at the time. This product also removed the buttons on the front in favor of a zipper. This is the style that is most recognizable as a motorcycle coat by the general public. 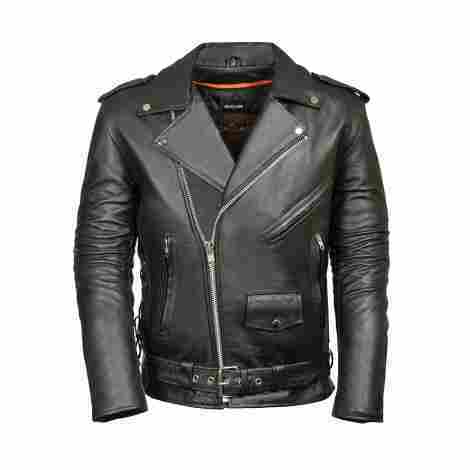 Racer jacket: Also known as a cafe racer, this s a very minimal style that is also cropped much like the Perfecto style. This has front chest zippers and can contain contrasting stripes down the sides of the sleeves. The name, along with the minimalist design was necessitated due to it being worn by returning soldiers after World War Two who used to race their bikes between pubs and cafes. Hide: The skin of an animal. Most often from cows, that is tanned in order to produce leather. The name is derived from the German word “Haut”, which literally stands for skin. Known for its abrasion resistant properties, leather can be made from deer, alligator, kangaroo, r any number of livestock animals. Leather: The end product of treating and tanning the animal hide. It is revered for its durability and flexibility, and s used to produce a larger number of goods. Leather can be found in several grades, from top grain leather to bonded leather. Top grain leather uses the outer layer of the hide, which contains fiber, densely-packed fibers, resulting in higher quality, bonded leather is also known as reconstituted leather, and is produced by shredding leather remnants and then bonding it together onto a fiber mesh. Sheepskin: Found mostly in the bomber style, sheepskin leather is renamed thanks to its superior insulating properties and high resistance to a variety of elemental factors. It is also regarded as being hypoallergenic, making it a great alternative to cowhide. Q: Do all have armor? No. Armor increases the price considerably and is only really meant for most serious riders and motorcycle racers. As such, it is considered an optional feature and only rarely is included. Q: Is wearing one required by law? When operating a motorcycle, the only legally mandatory piece of safety equipment that you have to wear is the helmet, and in some states, even that isn’t necessary. However, for the sake of your safety, it is strongly recommended that you wear full riding gear while on your bike. The use of a coat will greatly reduce the risk of injury to most of your vital organs. Q: Aren’t they only for biker gangs? No, they are for all riders, regardless of affiliation. They have become popularized by motorcycle clubs, both legal and illegal, due to both the safety they provide, as well as acting as a canvas for their club patches and colors. Q: Do they have to be made from leather? I will stress the importance of finding a coat made from leather as much as I can, but it is true that manufacturers have been making some very high-quality variations in a wide range of synthetic materials that are just as protective, and in many cases, much more affordable. 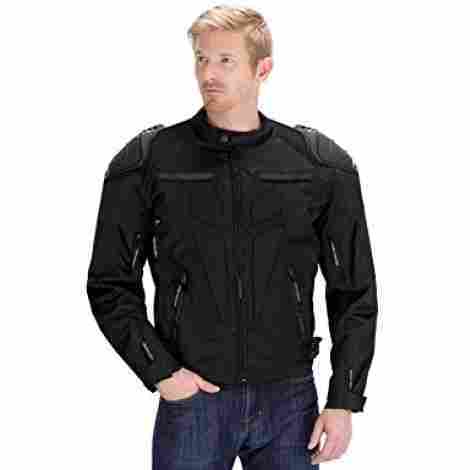 Quora – What are the best motorcycle jacket brands?